The Gambia Bar Association has said that President Barrow Youth for National Development was set up based on personal agenda. 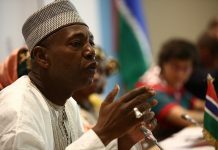 PBYND was set up in 2018 in controversial circumstances to promote the agenda of President Barrow. The group continues to be frowned at particularly from within political quarters. “The paramount quest of the Bar Association has been, and will always be, for the Constitution and its provisions in regard to the rights and freedom of the citizen to be upheld and be regarded by all authority as sacrosanct; for the rule of law to be observed by all, and the independence of the Judiciary respected. In our opinion, the independence of the Judiciary is an issue, which is so important and critical to our progress as a nation that it requires to be given constant attention,” she said.